Last night I had a disappointing meal. My first meal on this trip which really failed to live up to expectations. It was at Bakmi Gajah Mada (GM for short), a noodle restaurant which I had tried before a couple years ago and found to be "meh," but which gets a great review in the book that I use to scope out local good eats, Laksmi Pamuntjak's Jakarta Good Food Guide 2008-2009. "Wonderful." "Brilliant." "Supernatural." "Top of the game." This from an author who does not seem given to hyperbole in her other reviews, who rates places that cost US$500 a person and finds basic faults with taste and presentation. So Bakmi GM is "brilliant"? Well OK then! Maybe I went on a bad day the other time. No worries, I'll try it again. 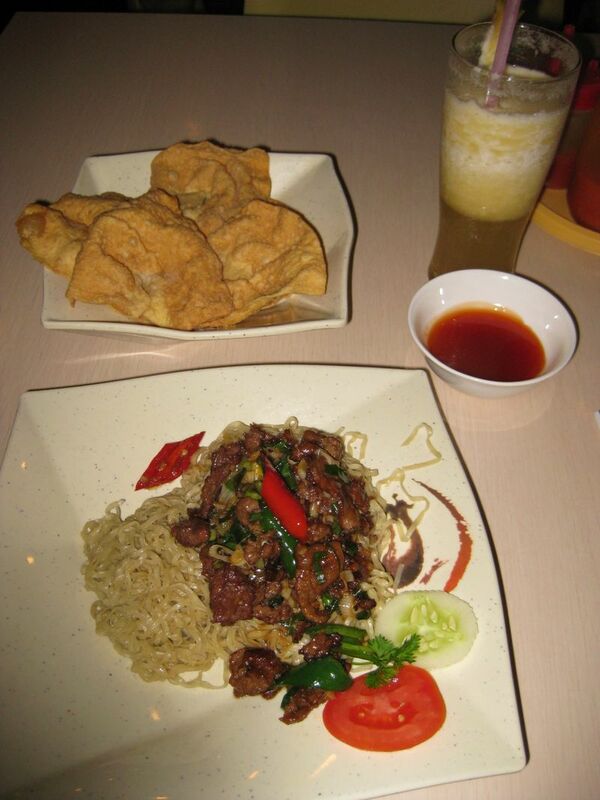 I followed Laksmi's directions precisely this time, getting the two dishes that she recommended by name: the fried wonton (pangsit goreng) and chili-fried beef noodles (bakmi daging cah cabe hijau). To drink, fresh pineapple juice. OK. First for the good news. The pineapple juice was competent. But I've never had bad fruit juices in Southeast Asia, and I mean ever. Basically they are just fresh fruit in a blender. Hard to mess that up. Now what's going on here? How could Laksmi Pamuntjak–a world traveller, a bonne vivante, a gastronome with three editions of a popular (and pretty expensive) English language food guide under her belt–consider this boring and uninspired food to be brilliant? My working hypothesis is that it's not about taste or presentation, but about modernity. When you go to Bakmi GM you're not getting authentic or even really "good" food. What you're getting is air-conditioning, waiters in uniforms, consistency, comfort, and an ambience of that middle class lifestyle that has really only been available in Indonesia for about thirty years or so. It's the same impetus that leads many very good restaurants all over Southeast Asia to locate themselves in malls. Bakmi GM is not about the food, it's about representing a certain social position. Sort of the way that McDonald's is in the US, or at least how it was when it first opened and represented the triumph of modernity, mass production, and food science over the varied competencies of local burger joints. Note the emphasize on "consistency" and the idea that it appeals to students who miss home. Maybe a parallel experience is a freshman from Orange County, CA in my Vietnamese class while I was still in graduate school who did her final presentation about the best restaurant in the world: California Pizza Kitchen. The problem with my hypothesis is that Laksmi P. is no aspiring middle class writer. I've met her. She's serious and far more cosmopolitan than I am. Her other recommendations have been very solid. And it can't really be her audience either, for her book cost US$26 and is entirely in English, which makes it pretty much geared not towards middle class consumers but rather for Jakarta's globe-trotting upper crust. They can absolutely afford much better than this, and they can find much tastier cheap eats at the side of any road. So call me perplexed. You might want to try Bakmi Gang Kelinci or Bakmi Aboen (both are in Pasar Baru)- much much much better than Bakmi GM. Or if you spare a bit time, Bakmi Bagan (from Bagan siapi-api, a small town in Sumatra) in Bandengan Utara is highly recommended. Have you tried Coto Makassar? or Sop Konro? I’m from Malang in East Java. been living and working in Jakarta for almost 3 years now. Still don’t know what’s so good about Bakmi GM. Strangely here in Indonesia, the great foods (in term of taste), are not listed in Laksmi’s book. The best foods are from street vendors. Lack of hygiene, but it’s good. Next time you visit Indonesia; especially if you plan to visit Malang, please let me know. I’ll take you around.